CNS News posted an article today about a recent statement by Transportation Secretary Anthony Foxx. Sir, with all due respect, I don’t think that is the problem. Foxx hired the U.S. Transportation Department’s first “Chief Opportunities Officer” in 2015. The position aims to make sure “Ladders of Opportunity inatives are coordinated, advanced and implemented across all levels of DOT,” according to the U.S. Transportation website. I would support making sure people in low-income neighborhoods have an inexpensive way to get to work, but that does not have to be a government program. Neighborhoods can easily form car pools to help each other find transportation to work. The streets in low-income neighborhoods do exist and generally are paved, so I think that the people in these neighborhoods can access ‘Ladders of Opportunity’ if they choose to. A person much wiser than I once commented that the best thing a parent can do for a child is to set the example of going to work every day. That is the culture we need in all of our neighborhoods. Steven Hayward posted an article at Power Line today about George Mason University. The University has announced that the University’s law school will be renamed the Antonin Scalia School of Law at George Mason University. Steven Hayward notes that this is surely going to cause a reaction among the students. It’s bad enough that GMU’s Mercatus Center is a Koch-sucking far-right-wing organization (e.g., see this New Yorker article, which discusses how “the Koch family foundations have contributed more than thirty million dollars to George Mason, much of which has gone to the Mercatus Center”). But now….this??? Let me remind everyone that Antonin Scalia was a corrupt, bigoted extremist. Why would anyone in their (far) right mind want to name anything after that guy, let alone a law school? Has GMU gone completely off its rocker or what? Or, as ThinkProgress Justice Editor Ian Millhiser puts it, GMU can now “stop pretending to be anything other than a conservative policy shop with students.” Ugh. I mean, what’s GMU going to do next, the Trump School for Ethics and Tolerance? I seem to remember that many of our university students were asking for ‘safe spaces’ where their ideas would not be questioned or challenged. How horrible that our students at higher learning institutes might be forced to think through or defend their ideas. At any rate, this reaction does not seem to be very tolerant. Does the student understand that the money donated by the Koch family is partially responsible for making his/her education possible? Has it occurred to the student who wrote the above to consider the political leanings of The New Yorker when reading their comments about the Koch family? How does this student feel about the money George Soros pours into American politics? It is a shame that this particular student does not respect the role Antonin Scalia played in defending the U.S. Constitution at the Supreme Court. It seems that a major part of the student’s civic education is missing. This year’s presidential campaign reminds me of the old Spy vs. Spy cartoons in Mad Magazine. There are so many twists and turns and behind the scenes things going on that it is hard to keep up. 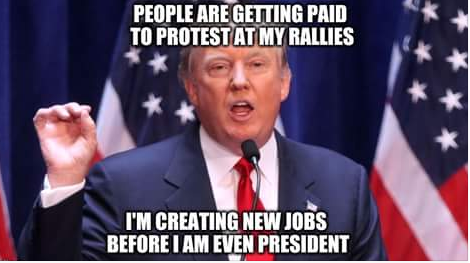 I keep hearing that Hillary Clinton can beat Donald Trump in the general election, but then I read about the money the Clinton and Soros organizations are paying protesters to disrupt Donald Trump events. If Hillary Clinton can beat Donald Trump, why is she disrupting his events? I am not a Trump supporter, but I don’t like to idea of shutting down the free speech of a candidate. I especially don’t like the idea of paying protesters to do that. At least they are paying them more than minimum wage. President Obama seems to have an ability to mistreat our allies and attempt to make friends with people who have hated us and will continue to hate us. However, some of our allies understand that despite our President, the American people support them. Israel is one of those allies that stands with us regardless of who is President. The U.K. Daily Mail reported yesterday that the FBI has managed to get into the Apple iPhone that belonged to the San Bernardino shooter. Technical people were very concerned about who actually managed to get into the phone–fearing that a criminal would now have a mechanism that could hack any Apple iPhone. However, the truth is very reassuring. An Israeli company helped the FBI in unlocking the iPhone used by one of the San Bernardino, California shooters, according to reports. Israel’s Cellebrite, is a provider of mobile forensic software that says it does business with thousands of law enforcement and intelligence agencies, militaries and governments in more than 90 countries. An official source told NBC News that the company had helped. Neither the FBI nor Cellebrite has confirmed the reports. The FBI hacked into the iPhone used by gunman Syed Farook, who died with his wife in a gun battle with police after they killed 14 people in December in San Bernardino. The iPhone, issued to Farook by his employer, the county health department, was found in a vehicle the day after the shooting. Please follow the link above to read the entire article. It is rather technical, but very interesting. Thank you, Israel, for helping America deal with terrorism. 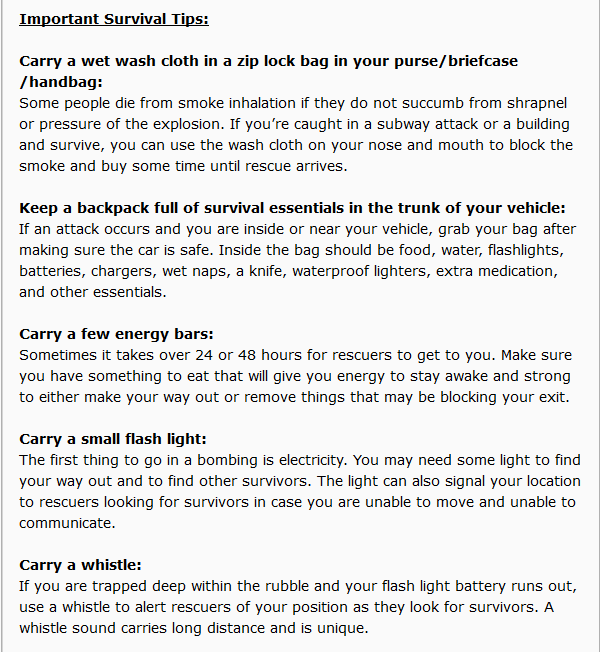 The picture above was taken from an article posted at The Federalist Papers. The Journal of Ecology and Evolution published the study conducted by researchers from Canada’s Lakehead University, which concludes that, while evidence shows that there is “reason for concern”, polar bears are not suffering the “climate crisis” that environmental activists would have you believe. Our perspectives on climate warming and Arctic sea ice decline are developed from an empirical examination of the open-source data on various indicators of these phenomena. We see reason for concern, but find no reliable evidence to support the contention that polar bears are currently experiencing a climate crisis. 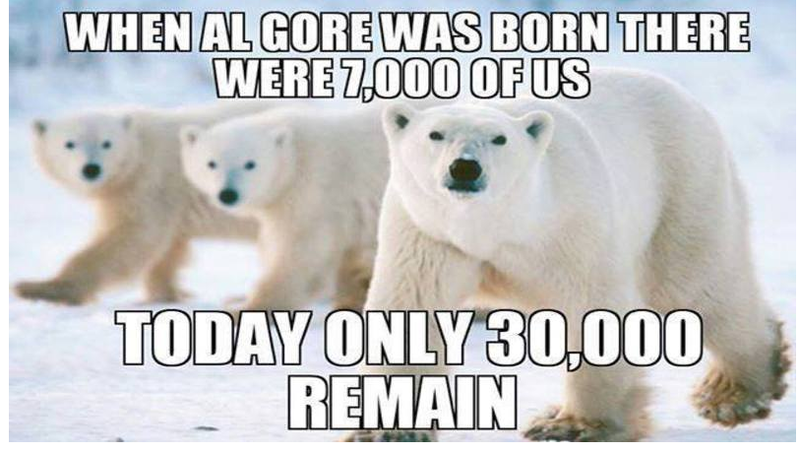 We suggest that the qualitative projections for dramatic reductions in population numbers and range are overly pessimistic given the response of polar bears, climate, and sea ice to the present. We show that much of the scientific evidence indicating that some polar bear subpopulations are declining due to climate change-mediated sea ice reductions is likely flawed by poor mark–recapture (M-R) sampling and that the complex analysis models employed to overcome these capture issues apparently fail to provide accurate estimates of the demographic parameters used to determine subpopulation status. The science of man-made climate change is not a science–it is a religion designed to set up the United Nations as the controller of the world. The goal is to redistribute the wealth of free, wealthy countries to tyrannies that are not economically successful so that tyrants can build magnificent palaces while their people starve. The earth’s climate has been changing since long before we got here, and it will continue to change in the future. I believe that we are obligated to keep the earth as clean as possible and to control pollution. We are also obligated to set up economic systems that allow people to prosper. Those screaming ‘global warming or climate change’ have no intention of actually helping the poor. Their plans are to use the climate as an excuse for wealth distribution. This is the height of political correctness, and it is dangerous. Immigrants need to understand that some cultural practices that were acceptable in their former countries are regarded as totally unacceptable in their new countries. I am sorry if an immigrant is offended by the idea that killing their children or wives for questionable behavior is barbaric. If they choose to live in a western culture, they need to know what is acceptable behavior and what is not. 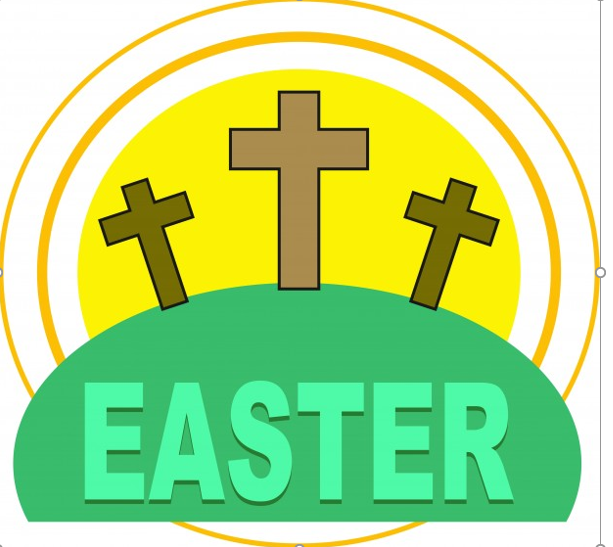 On Sunday March 27, 2016, just after 4:00 PM Traffic Officer Erik Castillo was patrolling Roeding Park in Southwest Fresno as part of the Easter Sunday Safe Park Operation. He noticed a young princess driving her convertible sports car on the grass. 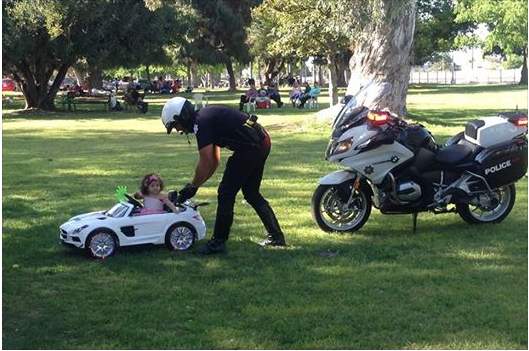 Officer Castillo conducted a pretend traffic stop and contacted the princess, later identified as one year old Avery of Fresno. Officer Castillo decided to issue Avery a Junior Motor Officer Sticky Badge instead of a citation and wished her a Happy Easter. The Daily Signal is reporting that thanks to more government regulations (courtesy of the Environmental Protection Agency) a new car will cost you at least $3.800 more (even after fuel economy is considered). When Congress and the Obama administration passed and implemented extremely strict fuel economy regulations, the Environmental Protection Agency (EPA) claimed that it would save consumers a few thousand dollars on gas and only add $948 to the price of a new car. Three teams of independent economists and engineers went up against the EPA’s analysts—finding much larger costs and smaller benefits. The most modest of the independent estimates works out to $3,800 per vehicle, even after the fuel savings are taken into account. Big government and government regulations impact all of us. 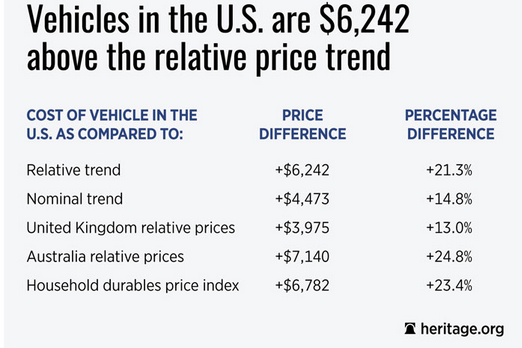 In a recently released Heritage Foundation research paper, we’ve compared the recent price trends to the scholarly predictions, and found that if U.S. vehicle prices had followed one of the comparable trends, cars would be between $3,975 and $7,140 cheaper today than they are. This massive expense buys very little change in global warming: less than two hundredths of a degree according to the Obama administration’s own estimate. Congress should scrap Corporate Average Fuel Economy (CAFE) standards entirely—they cost consumers dearly while having a negligible impact on carbon emissions. Failing that, a new administration can freeze the standards at 2016 levels to prevent the Corporate Average Fuel Economy tax from doubling by 2025, as the Obama administration has planned. It is time to get back to the concept of laws made by Congress outlined in our Constitution, so that we can hold our lawmakers accountable. The EPA and similar organizations have become the fourth branch of government, and they need to be put out of business. The Hill is reporting today that after his recent primary victories in Washington, Alaska and Hawaii, Bernie Sanders has stated that he believes that the super delegates will switch from supporting Hillary to supporting him. The latest delegate counts still put Sanders behind Clinton, however, with 1,004 pledged delegates to her 1,712. Of those, 469 are superdelegates who have pledged to Clinton and only 29 have pledged to Sanders. Sanders on Sunday said those superdelegates may begin to see the “reality” that he’s the best candidate to beat GOP front runner Donald Trump. There is absolutely nothing I can add to this article. Does This Qualify As A Conflict Of Interest? Roy Cooper is the North Carolina Democratic Attorney General who is running for governor in November. However, it appears that some of his campaign donations are in direct conflict with his current job as Attorney General. This might be something to pay attention to. Usually, the last three or four weeks before an election becomes the silly season. It is a time when you really can’t believe anything you read. There are more lies told in those three to four weeks than in the preceding six months and the following six months. Usually this occurs three to four weeks before a national election, but the current presidential campaign has not followed any of the rules that applied in the past, so I suppose we shouldn’t be surprised that the silly season started months ago. The current story that reflects the silly season is the National Inquirer story about Ted Cruz having had multiple affairs. Although that is something that Donald Trump seems to admit doing himself (and voters ignore it), evidently this is an important issue for Ted Cruz. Sometimes the double standard amazes me–remember when what Bill Clinton did in his spare time was off limits? Hot Air posted some information on the supposed scandal that may shed some light on the truth (or lack thereof) of the charge. I have no way of proving or disproving this story. Neither does Ted Cruz. That is the reason the opposition makes charges like this. One of the women named has come forward and said that the story is not true. Ted Cruz has, of course, denied it. Unfortunately, this story is simply a further example of how nasty this presidential campaign is. This campaign is anything but presidential. It is my hope that whoever is the actual source for this story, if they are currently holding public office, will be removed from that office in disgrace. This story, unproven, is simply not appropriate in any political campaign. Investor’s Business Daily posted an article on Thursday about the futility of appeasing terrorists. The reason behind opposing terrorists is very succinctly explained by Israeli Prime Minister Benjamin Netanyahu. Speaking via satellite to AIPAC’s annual conference in Washington last week, Bibi Netanyahu used the Brussels bloodbath, which Islamic State has taken responsibility for, to explain succinctly why there is no appeasing this barbaric new enemy. Western countries would do well to remember that the ultimate goal of ISIS is the establishment of a worldwide caliphate. This has been the dream of the Muslim Brotherhood since the Ottoman Empire fell. The caliphate that was the Ottoman Empire ended in 1924. That was less than one hundred years ago. In 1928, after it was clear that Turkey, the heart of the former Ottoman Empire, was going to be a secular state, the Muslim Brotherhood was founded in Egypt. The purpose of the Muslim Brotherhood was to implement Sharia Law worldwide and to re-establish the caliphate worldwide. Right now, both ISIS and Iran share those goals. The disagreement between them is over who will rule that worldwide caliphate. I listened to an interview this morning of an expert on terrorism. In the interview he pointed out some facts about the terrorist attack in Belgium that I have not heard widely reported in the media. The main part of the attack took place near the American Airlines terminal. It was timed to occur when passengers for a flight to Philadelphia were checking in for their flight (thus most of the victims would be American). The attack was also near a Starbucks Coffee Shop, where many of the Americans would go after they checked in. 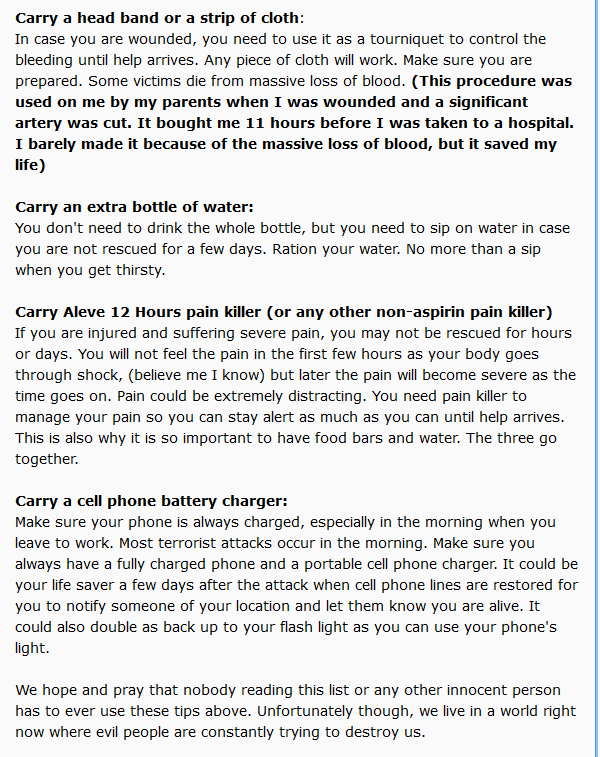 The suicide bombers were on a watch list in America, and it is doubtful that they would have been able to enter American legally to carry out attacks. However, the attack they did carry out does seem to have targeted Americans. President Obama’s repeated assurance that ISIS is “not an existential threat to us,” last week pairing it during his Latin American trip with the crack that “I’ve got a lot of things on my plate,” telegraphs not moral clarity but politically expedient complacency, as he plans the exhibits in his presidential library. Obama ought to be reminded that when it comes to the lives of the four or more Americans missing in Brussels, ISIS may very well have been an existential threat. Netanyahu’s words, meanwhile, should be carved in stone for the ages and spur total commitment to the destruction of today’s terrorists — everywhere and ASAP. On Wednesday, National Review reported that the student senate at the University of California at Berkeley has passed a resolution to make abortion on demand available on the campus. The Berkeley student senate has passed a resolution demanding that abortion, referred to as “medication abortion,” be made available on-campus so that female undergraduate and graduate students could “continue their education with little disruption.”The resolution explains that the university’s Tang Center used to perform abortions in the 1980s, but now there are no longer trained abortionists at the center. This is the kind of logic that amoral, feeling entitled, uneducated in the value of life students come up with. Their parents are paying good money for this. It is so sad. To stay informed about the radical Islamic threat to our way of life and what you can do as a citizen to protect our country, yourself, and your loved ones, please join us. Go to actforamerica.org and get involved today. Be the change. Make a difference. Help us keep America safe! The Daily Caller posted an article today about the Rev. Kenneth Fairley, pastor of Mt. Carmel Baptist Church in Hattiesburg, Mississippi. The article reports that the Reverend allegedly profited after the federal Department of Housing and Urban Development gave $47,000 to the local government, which gave it, in turn, to a nonprofit called Pinebelt Community Services to renovate houses. HUD has relationships with many such nonprofits that often function as expensive middlemen between government aid programs and those in need of help. In Fairley’s case, Pinebelt had no capacity to do construction and told the city it had handed off the money yet again via a contract with a New Orleans company called Interurban Development. But Fairley had arranged with Interurban’s owner to make the hand-off an on-paper-only arrangement at an inflated price. The article explains that the work that HUD paid for was done locally for less money than the grant, and Reverend Fairley kept the difference. HUD does little vetting of the middleman nonprofits to which it awards millions of tax dollars annually. In Baltimore, for example, it has funneled millions through a nonprofit called Enterprise Community Partners to pass it on to neighborhoods. But instead, its CEO makes $577,000 and it has 48 officers who were paid $267,000 on overage. Only half of its money actually made it to neighborhoods that needed it and no positive results have been demonstrated. The idea of revitalizing our inner cities is good. However, when the money for these efforts comes from the federal government, there is no way that the projects can be watched carefully for fraud and misuse of funds. Unless local people are directly involved in improving their section of any given city, it is quite likely that the efforts to improve the area will not be successful. If you truly want to revitalize America’s inner cities, we need to change the culture there. The inner cities will not improve until the people living there develop pride in their surroundings. Non-profit groups can be very helpful in this effort, but obviously a vetting process is needed to find the appropriate group. When Did Our Government Begin Bullying Nuns? Yesterday CBN News posted a story about the Supreme Court case involving the Little Sisters of the Poor. In the hearing, the justices appeared to be deeply divided over the Obama administration’s plan to exempt The Little Sisters of the Poor and other faith-based groups from being required to pay for birth control for women insured under their health plans. The conservative justices on the high court sounded in favor of the complaint by the groups that the administration’s exemption plan goes against their religious rights. Where does the government get the right to force a religious organization to purchase something that goes against their religious convictions? What the Obama Administration is attempting to do is limit the ability of the Little Sisters of the Poor to freely exercise their religious beliefs in the public square. If the court’s ruling is a 4-4 tie, that would mean four appeals court rulings in favor of the administration would be upheld. However, in parts of the country where another appeals court agreed with the faith-based groups, different rules would apply. Another outcome of a tie could be shelving the case until after Scalia’s replacement is seated on the bench. That scenario emphasizes the importance of the judicial leanings of any nominee to the court, an issue currently hotly contested in Washington. Although President Barack Obama nominated his pick to replace Scalia, Republican senators are trying to stall the process until a new president is in office. Republicans hope a conservative president will then nominate someone more conservative, with leanings similar to Scalia’s. If the government can limit the religious freedom of a charity organization of nuns that has helped the elderly for 180 years, they can limit anyone’s religious freedom. Regardless of how this case is decided, the religious rights of Americans are under attack and need to be protected. This article is based on an article posted at The Charlotte Observer yesterday and an article posted at The Daily Haymaker today. Both articles have to do with the power struggle currently going on within the North Carolina Republican Party. The power struggle began last year when Hasan Harnett was elected to chair the North Carolina Republican Party. He was the choice of the grass roots, but not of the establishment. Since his election, the establishment has attempted to strip him of power and now they are attempting to unseat him. In September, I reported on the efforts of the establishment Republicans to set up a separate fundraising entity–essentially a shadow party. The grass roots effort to fight back were stopped by the Central Committee postponing any negative consequences until they could gather the legislators who supported them to cast votes in support of the shadow party. Among other things, they included a dispute over the cost of attending the state convention. Now, less than a year after Harnett was elected the state party’s first African-American chairman with support from grass-roots activists, some party leaders are trying to oust him before the convention. But Harnett plans to stay. …The legislators are WHO saved the necks of David Lewis and Dallas the last go-around. Will our electeds once AGAIN ride to the rescue of cronyism, pettiness, and corruption? We’ll see. 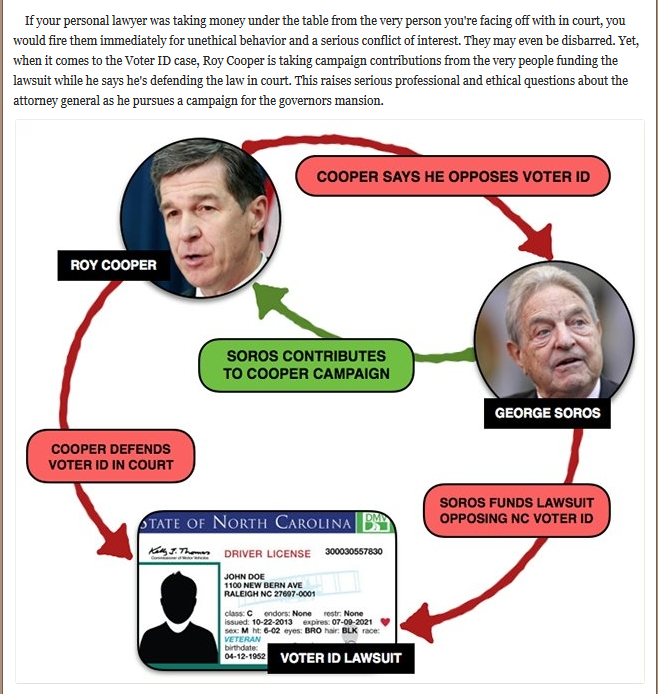 As you read this stuff, remember that this organization is completely controlled by the McCrory for Governor campaign organization. The governor COULD step in and calm this down IF he wanted to. His silence speaks volumes. It is time for the Republican Party Central Committee to listen to the people who generally vote Republican. These are the people who elected Hasan Harnett. I am sorry that the Central Committee’s little noses are out of joint because they do not control the chairmanship, but it is time for them to work with the elected leader. If they choose not to work with Hasan Harnett, many North Carolina Republicans will leave the party, and ultimately, the Republicans may lose the general election in November. The childish moves on the part of the Central Committee benefit no one.